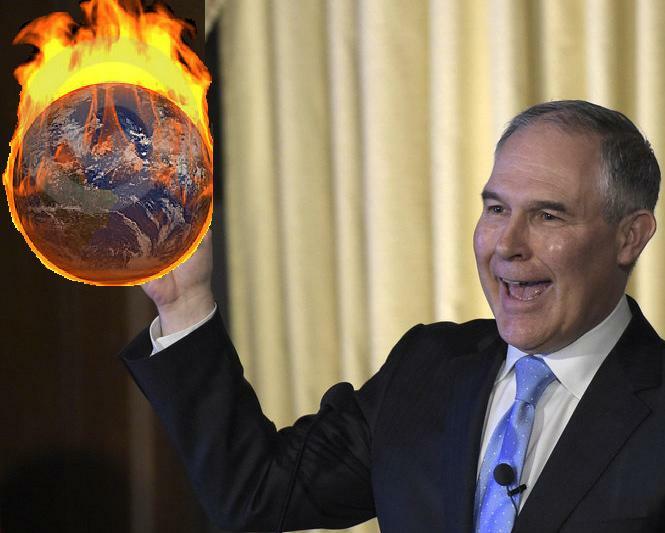 Scott Pruitt was picked by Trump to eviscerate the Environmental Protection Agency (EPA) and eradicate climate action and other environmental regulations. The fact that Pruitt and all of Trump's cabinet were picked to dismantle the departments and agencies they were charged to head was confirmed by Stephen Bannon at CPAC in February, 2017. By nominating Pruitt to head the EPA Trump has put the fox in the hen-house. Pruitt opposes environmental and climate action he also opposes science. Like Trump, he also opposes facts when they refute his agenda. He has a track record of undermining the Clean Air Act, the Clean Water Act, and anti-pollution programs He has spent much of his time as the former Attorney General of Oklahoma fighting the EPA in the courts. He has sued the EPA multiple times mostly on behalf of the fossil fuel industry. Pruitt is an ally of the fossil fuel industry. He even defended Exxon from prosecution over its corruption and subterfuge. One of Pruitt's staunchest supporters is billionaire Harold Hamm, who is president of Oklahoma-based Continental Resources. Hamm, who is a pioneer of modern horizontal fracking was a Trump campaign advisor and although he refused the post Trump offered him the position of Energy Secretary. Pruitt is not only intent on destroying environmental oversight he has also sued the Obama administration over the Affordable Care Act and Dodd-Frank financial reform. The EPA's efforts are designed to protect Americans. However, like the rest of the Trump administration and especially Trump himself, facts don't matter to Pruitt. They undermine fact based reporting so they can control the narrative and lie to Americans unencumbered by oversight from the fifth estate. Trump's war against the EPA has already begun and as soon as Pruitt was confirmed he disbanded the Environmental Protection Unit of the EPA. The agency has since ceased to enforce environmental regulations. The GOP has already put forward legislation to kill the EPA outright. Although the Trump administration and Pruitt accuse Obama and the EPA of overreach, It should be clear by now that the current president is the one who is guilty of overreaching with executive orders that are highly questionable from a constitutional perspective. If Pruitt has his way the US will no longer combat climate change nor will Americans have protections against polluted air (mercury, arsenic and other toxins) and water. The GOP has already moved to eliminate restrictions preventing the dumping of waste into rivers and streams under the Waters of the United States rule. The health of Americans is in the balance. Together the eradication of these laws will make even more Americans sick and increase the death toll. This is a destructive and deadly application of the government's authority. Nonetheless the Clean Power Plan, the Obama administration's signature climate and environmental rule will very likely be killed by this administration. If the courts uphold the plan it would mean that there would need to be public notice and a comment process. Legal challenges to Puritt's agenda are certain. Soon after Pruitt was nominated environmental groups and New York State Attorney General Eric Schneiderman indicated that they will use the courts to compel the Trump administration to enforce environmental protections. If he is not stopped, Pruitt will oversee massive increases in pollution and add to the liklihood that we will not be able to reign-in climate change before we reach tipping points from which we will not be able to recover. Like a modern day Nero he will fiddle as the world burns.